I put the word “proponents” in quotation marks because support for the Jewish state is subject to slippage these days as never before. It is becoming increasingly difficult to find a true proponent of that prophetic nation. The North American continent encompasses the two national entities that have most been supportive of Israel’s right to exist – the United States of America and Canada. This support is in contravention to attitudes and policies of most other nations of the world. The United Nations pulses with collective hatred for the Jewish state. Pressures are on the rise to change the North American support for Israel from one that is more and more tenuous to that of support for enemies blood-vowed to wipe the Jews from the earth. It shouldn’t surprise students of Bible prophecy who study eschatological matters from a literalist perspective that the European Union (EU) is among those who want Israel marginalized. The EU is believed by many to be the nucleus of the reviving Roman Empire – the region of Europe out of which Antichrist will one day step onto the stage of false peace making (Daniel 9:26-27). The geopolitical reason for the Europeans taking the side of the Arab countries is most often given as the desire to keep oil flowing to the EU energy-thirsty member states. But the real reason behind the support for the Islamist regimes is satanic rage that is destined to bring all nations of the world against God’s chosen people (Zechariah 12:1-3). We can see in today’s headlines the political ringmasters of that very region of the world beginning to bring to bear increasing pressure on America to come down on the side of Israel’s enemies. WASHINGTON — U.S. policy toward Israel has been increasingly influenced by the hostility of the European Union, a report said. A report by a leading analyst said the EU has become the most influential lobby in the United States regarding Israel. Steven Rosen, a director at the Middle East Forum, said EU leaders were pushing Washington away from Israel and toward the Arab world. "European leaders are the most effective external force urging the U.S. government to move away from Israel and closer to the Arabs," the report, titled "The Arab Lobby: The European Component," said. The current U.S. presidential administration seems to have little problem with falling in line with the pressures being applied. President Barack Obama, while on a ten-day trip to India and Indonesia, where he reached out yet again to try to show his country’s desire to embrace the Muslim world in friendship, expressed his displeasure with Israel for continuing with construction of homes within its sovereign territory. He complained that he had not been given a heads-up about the building of the thirteen hundred new homes in East Jerusalem. The announcement was made while Israeli Prime Minister Benjamin Netanyahu was in New Orleans on an official visit. "This kind of activity is never helpful when it comes to peace negotiations," Obama said. The Europeans were unhappy, too. 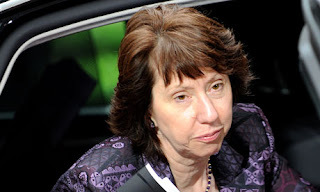 EU foreign policy commissioner Catherine Ashton said, in commenting on Netanyahu’s announcement, “This plan contradicts the efforts by the international community to resume direct negotiations and the decision should be reversed. Settlements are illegal under international law, constitute an obstacle to peace and threaten to make a two-state solution impossible." The U.S. State Department fell in line with European diplomatic expression of anger. U.S. State Department Spokesman Philip J. Crowley said, "We were deeply disappointed by the announcement of advance planning for new housing units in sensitive areas of East Jerusalem. It is counter-productive to our efforts to resume direct negotiations between the parties." The stark contrast I mentioned to begin this commentary - that I saw while preparing for my Canada speaking trip - was that between the American administration and Canada’s top leader. While President Obama has consistently shown what I feel to be diplomatic disrespect to Israel and Netanyahu, Canadian Prime Minister Steven Harper has unwaveringly stood by the nation that should be North America’s closest ally. Canadian Prime Minister Stephen Harper on Monday delivered a pro-Israel speech at a parliamentary conference which dealt with ways to fight anti-Semitism. Harper implied that his country did not secure a seat at the United Nations Security Council due to its failure to cooperate with an anti-Israel policy. "And like any free country Israel subjects itself to such criticism, healthy, necessary, democratic debate," he said. "But when Israel, the only country in the world whose very existence is under attack, is consistently and conspicuously singled out for condemnation, I believe we are morally obligated to take a stand. Not just because it is the right thing to do, but because history shows us, and the ideology of the anti-Israel mob tell us all too well, that those who threaten the existence of the Jewish people are in the longer term a threat to all of us," he said. "Whether it is at the United Nations or any other international forum, the easiest thing to do is simply to just get along and go along with this anti-Israel rhetoric, to pretend it is just about being even-handed, and to excuse oneself with the label of honest broker," Harper added. Harper stated in his speech that "as long as I am prime minister…Canada will take that stand, whatever the cost.” ("WorldWatchDaily Page Two News," 11/10/2010, http://watch.org/). The nations of the world will be judged by Israel's god - the only God that exists. How world leaders deal with the Jewish state determines the fate of their own nations, in the ultimate sense. That time of reckoning, according to the deluge of end times signals to which this generation is witness, can't be far off.